We just booked our tickets to the States for Christmas, and are crossing our fingers, hoping for snow. The first year I took Alex to Bend for Christmas, we had TONS of snow. On Christmas Eve, I sent him up to Mt. Bachelor for a ski lesson (growing up in the Southern Hemisphere, he had never seen a white Christmas! ), and it was snowing so hard, he couldn’t see the road. After a few hours of skiing, my little Honda was so covered in snow, he had to enlist newly made friends in the ski lodge to help him dig the car out to leave. 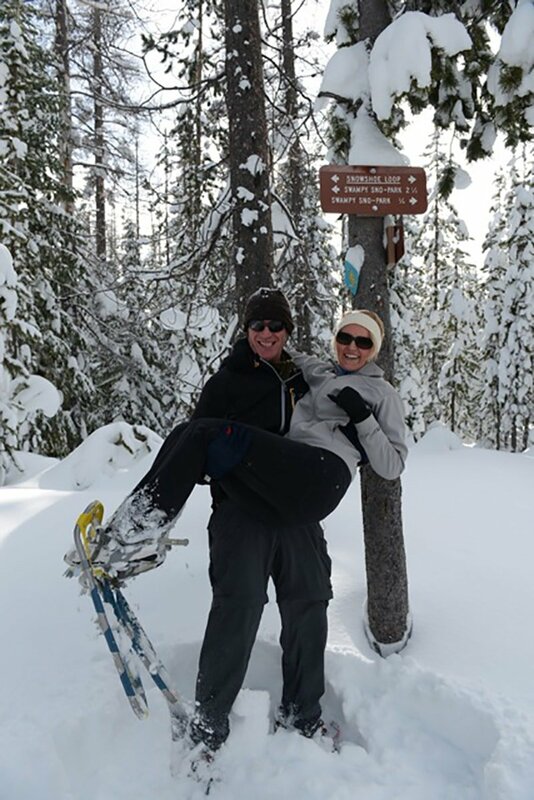 We spent our holiday going for runs in freshly fallen, unmarked snow, snowshoeing, and warming up by the fires in the local breweries. My man, who has always shied away from the snow, chasing the sun, as I do, fell in love with winter. So much so, he had no problem shelling out the large amount of money for two plane tickets to Oregon (from Asia) the following Christmas. Then, last year ended up being the warmest Christmas in Bend, Oregon had seen in 20 years. It was sunny, 40-50 degrees f, and we found ourselves hiking in short sleeves. We went hiking in places I’ve never seen in the winter, because usually the roads are too buried in snow. 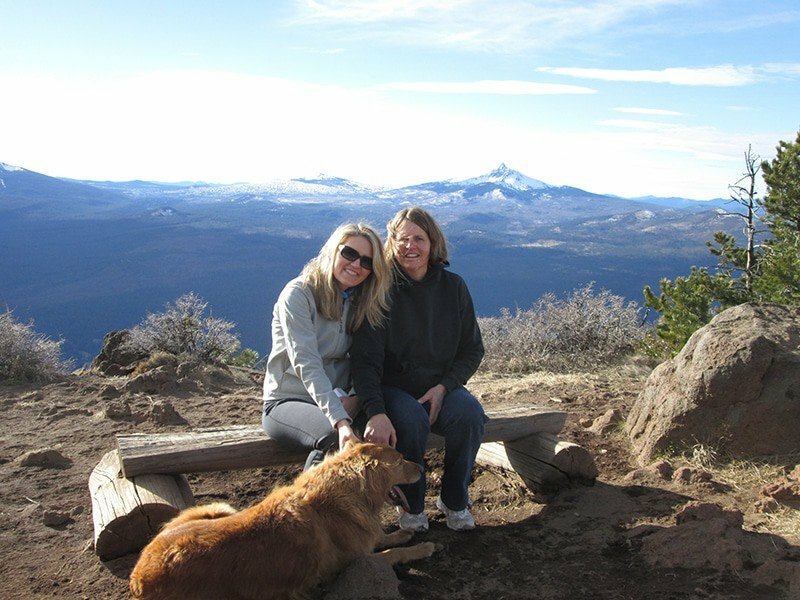 The photo below is of our hike to the top of Black Butte — no snow, even on top! We prayed for snow our whole trip, but it just wasn’t happening. The day we landed back in Kuala Lumpur, called my mom to tell her we’d made it, and I am sure you can guess what had happened in Bend while we were crossing the Pacific — covered in snow. Sigh. To make sure our plane ticket money wasn’t a total waste, we made up for the lack of snow with extra micro brews by the fire at the local brewery. 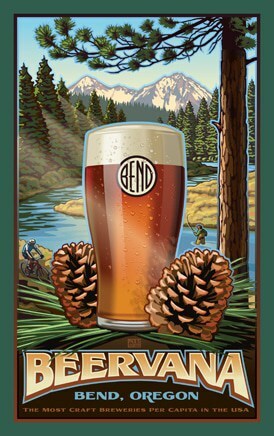 Bend has 14 microbreweries- in a town of merely 80,000 people. Snow or not, Bend rocks. We made sure to purchase one of these posters to frame for our condo in Malaysia. And that made us feel a bit better. So here’s our prayer for **snow**. #PracticingGratitude. Bend, Oregon is amazing, and I am so lucky it’s the place I get to call home. You know what you need a lot of when it snows? Yep, soup. 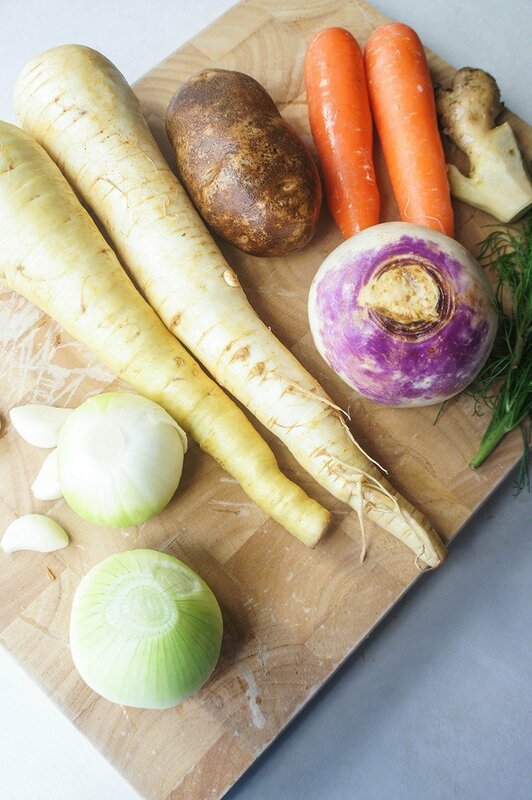 And all good soups start with wonderful veggies. I’ve made this soup for many years. The touch of ginger adds a ton of flavor to an otherwise mellow and creamy base. The original recipe (that I got in a Soup cookbook from Barnes and Noble years ago, and don’t have anymore) called for a cup of milk. I used to add about 1/2 cup, but since I don’t process dairy well, I mostly just leave it out. Add milk or coconut milk, if you’d like some extra richness! 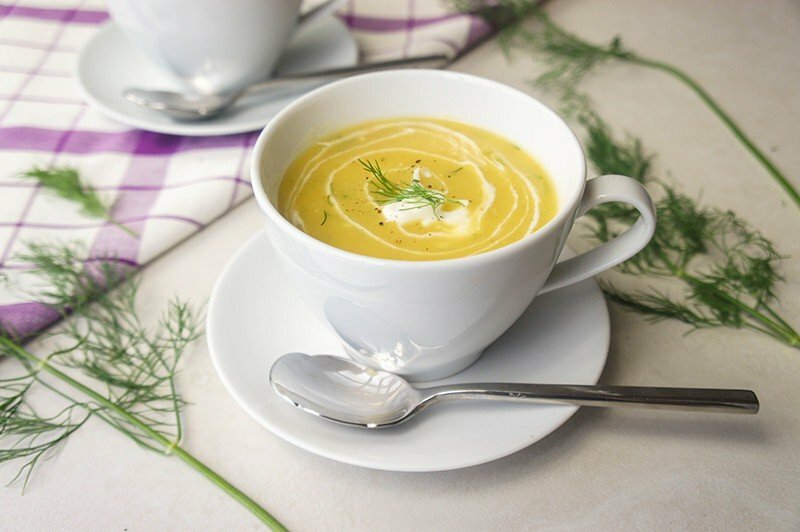 A creamy, comforting soup, with a hint of ginger and dill. A perfect winter meal or starter. In a soup pot, add olive oil, onions, and garlic. Over medium heat, saute until onions are translucent. Add water and vegetable bouillon or broth, and bring to a boil. Peel and chop the remaining vegetables. Add to the boiling broth. Continue to boil over medium high heat for 15-20 minutes, until the vegetables are tender. Remove soup from heat, and add the ginger root and dill. In batches, process the soup and vegetables in a blender (or immersion blender) until soup is very creamy. Add milk or coconut milk, if desired. Season with sea salt and pepper. Garnish with creme fraiche and extra dill, if desired. I love a good healthy harvest soup and this one definitely fits the bill! I can't wait to try on a cold night (every night for the next 4 months!). It is a great comforting soup. Perfect for many of those cold nights. I even love taking it in a coffee mug in the morning. A great way to warm up and get a dose of veggies in the morning. Thank you so much for the note! Yes, the ginger adds so much flavor and interest to this soup. Really makes it. Even the subtle dill flavor makes it taste special.I have tried a Vitamix. I used one in the States, but I am living in Malaysia- stupid 220v electricity! A Vitamix in the States can be as little as $400, but in Malaysia or Aus, easily double or triple. Since i don't think I'll be here much longer, I just can't justify it! As much as I miss having one. It's not the placebo effect- it really does make everything creamier and more amazing.And I eat soups year round here in KL! Just turn on the a/c and enjoy! I was just in Melbourne a month back, and it certainly was cool enough for soup in the evenings. 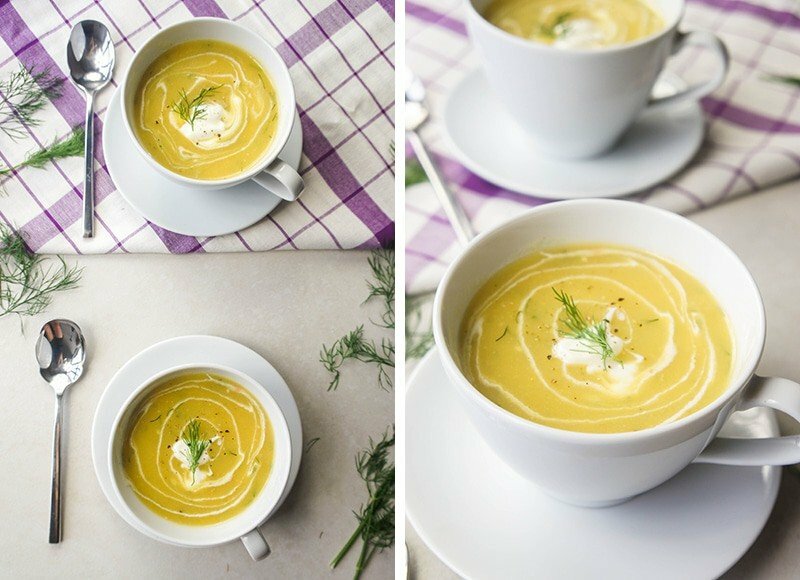 I know it's getting warmer..
Michelle the soup looks incredible and so great for fall/winter! Your Christmas plans sound pretty incredible too :). Crossing my fingers for snow for you guys. I definitely know what it's like to plan ski trips in Oregon and have the weather not cooperate. But I have a good feeling about this year! This soup looks delicious. Can't wait to try. Looks like winter is already descending here in the States so maybe that will mean snow for you. My mom just told me it's supposed to be another warm winter in Oregon! I am just not going to tell Alex that. Thanks Michelle! I love soups-- warm or cold outside. 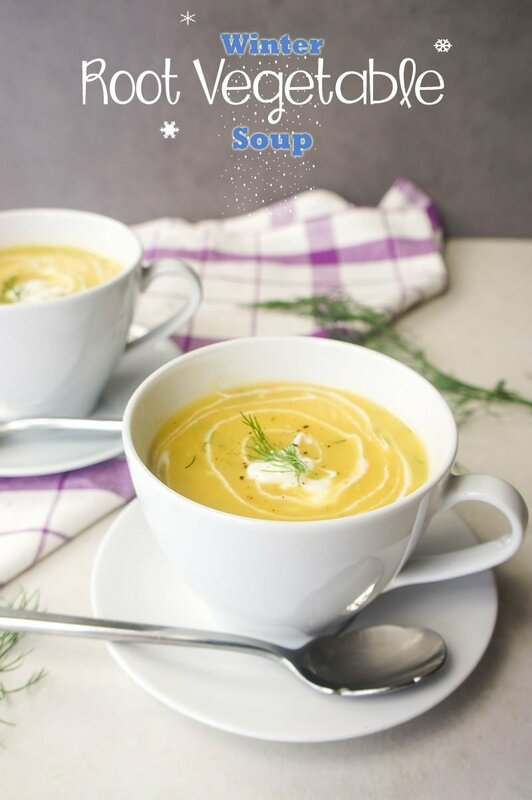 I never get cold outside, but I still crave soups during this season! I hope you get the snow for your visit! We had a very snowy winter here last year in the Northeast and we're supposed to get more of the same this year. My kids love to ski and snowboard so they will be happy. I think one of the things I like best about the cold weather is soup! Your recipe looks delicious! Pinning and sharing! Thanks so much for sharing it with us at Foodie Fridays...thrilled to have you join us! This soup looks amazing! I've got a bunch of parsnips and turnips, so I'll have to give it a try. Thanks for including the link to my clam chowder. That's so nice of you! This looks delicious! I love that you added dill, I can't wait to try making this recipe at home! Thanks for sharing.